I remember as we were growing up, we idolized people for their success. What was success? Money, fame, popularity, shiny cars, big houses, jewelry, and expensive vacations – did they signify success? Yes! We studied hard to get good jobs in well-known organizations. Life was meant to be lived in the fast lane. Hang around with glamorous people, be seen and heard with those that are in the limelight, travel abroad were all part of the aspiration game. With passing years, the aspirations got bigger. Bigger houses, bigger cars, bigger gadgets, more expensive watches, international schools for the kids, more grueling hours in the office and at home, more EMIs for more possessions. You are making money, lots of it. When you exchange notes with your batchmates, you have lofty titles to display against your name. You also have the expression on your face that says, “You are important! You are always busy.” You have arrived. You run and run, till one fine day, you are just too exhausted to even get up. You feel emptiness, a longing, a burnout, a bone-deep fatigue and a desire to break free! Projects don’t look as exciting. Travel begins to feel numbing. All that time away from family even when at home is alienating you from the ones you love and taking an emotional toll on you. Huge bills and EMIs have shackled you completely in their clutches. That camera, the guitar in the attic, a long forgotten MontBlanc that is a gift from your father beckons. You are torn between what your heart desires and what the world expects from you. Some are bitten by the bug to do their own thing, start their own enterprise. In a nutshell, people hit a phase when they want to “Follow their heart!” It used to happen by the itchy 40s, the much maligned middle age. But these days, even people in the 30s are giving up everything they slogged for to chase a dream. And this tribe of freelancers, entrepreneurs, and people on a sabbatical is growing rapidly by the day. Is it a reflection on the jobs we do that seem to demand every minute of our waking time paying scant regards to our family time? Are companies doing enough to keep the jobs challenging and the employees motivated? If everyone cribs about a bad boss, then where are the good people? Did we really choose the fields that we never liked to begin with? These are interesting questions to seek answer to. As for the confused souls, there are some who take an unpaid leave and just take a break and try to figure out exactly what they want to do. There are organizations that give you such breaks and yet have a job waiting for you when you get back. There are some who just quit and get into a completely divergent field after their interest. If they are single, have less monetary obligations or have a working partner, it may be easier taking this step than if they are the sole breadwinners of the family. The more debt you have, the more difficult it is to have the courage to do something this drastic. It is a huge step and must be gotten into only after a lot of soul searching especially in a bad economy. But, the essence of my post is that, it is important to recognize that money will not always give you happiness and mental peace no matter how much you want it to. In my opinion, it is a hygiene factor in Maslow’s hierarchy. You need some of it to have basic comforts and basic happiness. But too much of it does not guarantee an exponential increase in happiness. Somewhere along the line, the inner you will find its voice to reach your mind. Not only do I speak from personal experience but also from that of others who have taken similar steps. Along with this comes a realization that somewhere along this new path, you will shed the conventional paradigms of ‘success.’ You will find that an old car does not pinch as much. You may also not feel the itch to own the latest gadget despite not really needing it. A trip to the zoo with the family or a vacation in the hills may suffice instead of foreign jaunts. You may give up on many ‘lifestyle’ choices yet strangely you will find yourself more peaceful and content. That is not to say that sometimes, many times; it will pinch you about what could have been. Choose this path only with utmost conviction because it is not easy. To the families of those who quit the rat race, I say, “I know what you have been through.” But your spouse is not only a money making device. It will be difficult and they might not always find success but allow them the opportunity to walk the path they desire. They can always figure their way back if need be but give them the encouragement and trust to reach out and pluck their dreams. And to the men, I say, I have utmost respect for the kind of strenuous jobs you put up with only to keep your families running. Our cruel society allows its women to take breaks or even give up work without batting an eyelid. But God forbid, if a man does that! I do hope that your work is your path to contentment no matter what you choose to do! This post is my acknowledgment and admiration for all those I know and read about who give up a set path to pursue what their heart desires – the social workers, the writers, the school teachers, the freelancers and the entrepreneurs. One must pursue the dream and enjoy what one does! Unfortunately, most fall in the trap of trying to be in the game of one up man ship bringing misery of accumulated loans, haywire routines and ill health! A meaningful post, Rachna! I think ‘enjoy what one does’ sums it for me. If you are lucky to love and enjoy your current job then by all means continue doing so. But if you are miserable inside, perhaps it is time to take the bull by its horns. Thanks for reading, Rahul! You and I are so connected, Jas, even in the way our husbands quit their IT jobs and how both of us are into Content writing! Life isn’t so bad after all? Thanks for reading, Jas! Nice. I wish I could do that one day. I think you are already pursuing your passion in writing and taking it ahead. That is pretty cool, isn’t it? Thank you, Manika! This one was written for you. I agree, I hope those who are searching find their answers and a way out. Often passion is a great driver. Life can take you on unexpected courses, something you could have never envisaged and surprisingly it can be very fulfilling as well. Such a relevant post Rachna… What we want, what we have and what we do? Such important questions… I think one of the reasons why people crib about their jobs apart from the usual ones is that in India there are no proper labor laws … Speaking for the IT sector I can say the Indian MNCs especially don’t care..I know I work in one! Also like we see people and colleagues abroad taking off for months and then returning to a new job or their old job that just doesn’t happen here, in IT Industry atleast as far as I know…They raise eyebrows at the time off and suddenly you become unwanted… It’s difficult, the choice to do what we love to do … I don’t love my job at all but till I have something to fall back on I’ll have to wait…I’m thinking of taking LOP for 3 months to visit my husband, that itself is scaring me for I don’t know what I will come back to on the job front… Confused ! Life’s biggest tussles are fought between the mind and the heart. In India, Corporate jobs are equal to being slaves. I know exactly what you are talking about. Having harsh deadlines, being made to work long hours and even at home and hardly considering family commitments are all hallmarks of a ‘challenging’ job these days. It is even tougher for women who have so much balancing to do on a family front. Yet, it is not easy to throw away a career you have slogged to build. Very, very tough choice. I hope you have a good time with hubby. And sometimes time away from the rat race gives you great perspective. It did for me when I accompanied my husband on a project to the Netherlands. I was working in a company here. They even sanctioned my unpaid leave. But the time I had there was so much fun especially for my toddler son who really missed me a lot due to my odd hours at work. I just came back and resigned. I did not think twice. Somehow I could not go back to that hell hole. latha recently posted…A Woman with an enlarged heart!!! Latha, yes all that you say is true. And one must not quit and throw away one’s own hard work for the sake of doing so. Some people just heed a calling or crave to fill a vacuum deep within. It is only when you feel that way should you take that step. Rest, most of us continue on the conventional road and if they are happy doing it, why must it concern any of us. Thanks for reading! So not easy! But definitely worth it at the end! Well said, Rachna! You have summed it aptly, Veens! This post really hit home Rachna. I really admire people who get off the trodden path to chase their dreams. It’s not an easy choice, but it is a choice that gives you the most happiness and satisfaction. Ruch recently posted…The Japanese and the Art of going Dip Dip Dip ! True that, Ruchira! I think as we grow older, we start looking beyond the gloss and crave for more substance especially internally. You want to keep the “I” satisfied too. Thanks for reading! Well said!! I think right from childhood we’re conditioned into following a path that’ll lead to the success model you mentioned, we are rarely encouraged to look inside and find ourselves. That kind of self introspection comes much later by which time most of us are already burdened with home loans and young families. The change needs to start from a young age!! Your comment delighted me, Fab! You really reached the crux of the post. I completely agree. We all aim for the conventional symbols of success. Somewhere along the way, with age and wisdom, we start craving more of what the soul desires. Many of us may have gone for qualifications more out of their importance and glamor rather than because they were our true calling. That is why it warms my heart to see so many people giving up everything to pursue their dreams. It may seem like madness to some but to them it is thoroughly satisfying. Like you said, it may be tough if we have loaded on habits and loans that rely a lot of money. Thanks for reading! First and foremost, let me tell you how glad I am to have met you. Someone who thinks on the same wavelength as I do.. many times way above, making me learn a lot. Thank you, Seeta! And have you noticed that there are more and more people who are actively showing the courage to take the step that you have taken. Heart and health first! I am so proud of all the people who find the strength within to give it all up and choose something else after their heart. It is not easy. The fight is as much with yourself as with the perception and thinking of the society. Yes, indeed a supportive better half is crucial else life can be filled with guilt and bitterness. But most importantly, we need to convince the person within. Because there will be times when you may transiently regret doing what you did. But I am convinced that this is the path to happiness and contentment and it does not have to lead via money solely. Thanks so much for reading and for your inspiring words! 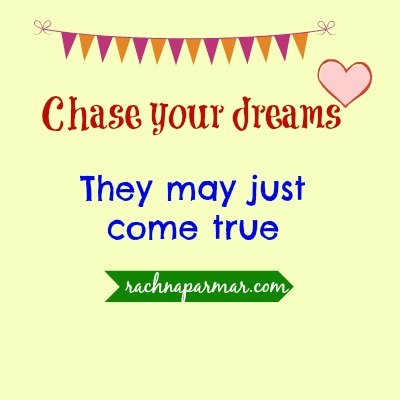 Rachna recently posted…Chase your dreams! Being a career person for 4 years, it wasn’t easy for me to give up on that. But fate had something else in store for me. Even though I do miss my paychecks sometimes, I’m absolutely satisfied with what I have right now. That’s great, Nita! I can understand all that you are going through. But you can still earn your money by shifting tracks and pursuing what you desire. Maybe, it will not be as much as before but it will give you immense satisfaction for sure. Thanks for reading! Need I even say how much I agree? 🙂 Though I never went through that initial phase and the soul-searching 🙂 Always knew – from the time I passed out of IIM – that the one thing above all else I wanted to be was the master of my own time. You are one of the inspirations, Suresh! How lucky that you were always so clear about your path. Most of us had to debate, struggle, convince our families before we could move ahead. Thanks for reading! Not impossible and I am doing it 🙂 ….well, almost. There are still times when a woman is first expected to sacrifice her dreams for the sake of her family. Well done, Janu! We have just one life. As long as you have the support of your family, all is good. If we start caring about the society then our own wishes may take a beating. Thanks for reading! I say this is highly relevant to many of us. Many of us have done it already, many are in the process and many contemplating. I am in the third row.. Let’s see how it turns out. True that, Diwakar! I see a churning as you pointed in many people. Well, all I can say is, more power to those who choose to leave the rat race to pursue the chase to search for inner happiness instead. And good luck to those who stick to to the plan to keep making it bigger. If there is anything I have learned in life, it is that there are no wrong answers as long as you are truthful to yourself. There cannot be any wrong answers here if you are truthful to yourself. Unfortunately, the way we perceive success drives us towards a life that sometimes makes us suppress that truthfulness to oneself. Some people heed it when they are younger, many others heed it when they are in their rocking chairs. Thanks for reading, Rickie. Thank you for reading and connecting with the post,Sid! I have a lot of respect for people who have the courage to go after their true calling. Having been in this situation, I know it cannot be done without the love and support of your near and dear ones. Know in your heart that you always have a solid education and work experience to fall back upon in the event of a rainy day. Meanwhile, enjoy the happiness that your calling gives you but also plan out how you will go about it and give it your best shot. Also, always have the pragmatism to know when and how to quit. Rachna, this post was written with so much passion and it’s time someone recognized the men in our lives and how hard they work to keep us happy. If we learn to differentiate between our needs and wants, we’ll discover how little we need to be happy. Thanks so much, Purba! Alas, they are the silent crusaders. The sacrifices they make to keep their family’s lifestyle often go unsung. So happy you liked the post. And indeed, I agree that once we know the difference between needs and wants, very little is sufficient as long as we are happy. Pressure from family, culture, tradition etc..really gets one’s dreams hampered and I guess the path one chooses is often sadly not what their hearts desire for. And kudos to those who do. Varun Agarwal was a classic example of an engineering drop out and pursued his dream. Chasing your dreams is a risk that one ought to take if it really means that much! Yes, if the heart is unhappy perhaps it is time to relook at the life we are leading. Stress and unhappiness are a reality. Thanks for reading, Danny! Your FB post on the lunchbox and this.somewhere i can relate to. men work a lot these days, esp in the sw industry there is no closing the laptop. the lady had given up her job and was taking care of kids. In another online forum, some one had confessed seeing a fellow colleague . long working hrs, staying away from spouse, … i think u did write about infidility at work? Yes, I have seen it firsthand with my husband’s work and that of many friends too. Yes, a woman giving up her job to raise is family can be hurtful. But imagine if a man wants to give his job to pursue his interests, he most times does not have the liberty to do that. Yep, opportunities away from home and distance from the spouse can cause other relationships to fill the gap in. Chasing our dreams really needs courage. I keep doing it now and then – exploring my self. some times Bazz Lurhman’s sunscreen song fits me 🙂 Its true that Men dont even have the slightest chance – atleast in our society ! Thank you so much for reading, Afshan! Yes, chasing dreams does need courage. Glad you are chasing yours. Amazing post Rachna. I could very well relate to it. Though I’m relatively new to the rat race, I did have my own share of strenuous days when I’ve had to work for more than 12 hours on a daily basis, sacrifice all weekends and work through the nights, many a times. In the beginning its fun, it’s cool to be occupied and busy. It’s cool to not turn up for events because of work commitments. Slowly the realization dawns that we’ve succumbed to the rat race and getting out of it involves more sacrifices than getting inside. It’s then that we start questioning ourselves and wonder if it is really worth it. At this important juncture, the decision which people take will shape the remaining years of their career. People either inspire themselves and start doing what they like, or get into a sort of depression and decide that nothing can be done. Ashwini C N recently posted…Being let down by ourselves! I am happy for you, Ashwini! That you have taken stock and moved your line of work to something that is close to your heart! Rachna recently posted…Home sweet home! There have been tons of challenges, however, I am glad that I am doing whatever I always wanted to do. Sabyasachi, I look up to you for your courage in following your passion. Indeed, your heart is happy. As you rightly pointed out, there are lots of challenges. I agree with pretty much everything you say here. We have to let go of the conventional definitions of success and look for greater meaning in our work, life experiences and choices. Otherwise there is no end to this rat race….the more you have, the more you want…the vicious cycle has to be broken to let the light in. Great post, Rachna! Thanks, Beloo. The more you have, the more you want. So true. And we all need to know the balance.